Wei Liu (Grad Dip Adv. Clinical Nursing 2006, M. Advanced Nursing 2007, PhD 2012) is Assistant Professor at the College of Nursing and Public Health at Adelphi University, New York City. I chose to study at the University of Melbourne because of its world reputation. I also loved the tranquility and cultural diversity of the city of Melbourne. 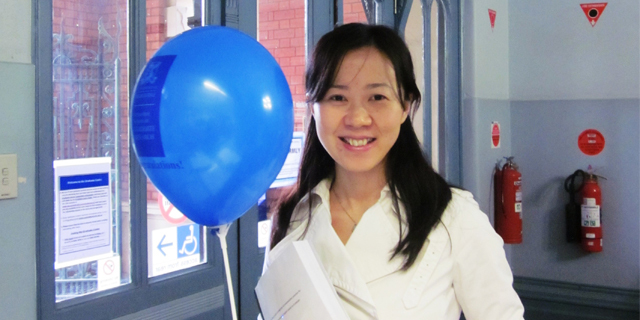 The strongest memories of my time at the UoM were the great friendships that I formed with my fellow PhD students. We used to go out on Saturday afternoons to enjoy different cuisines on Lygon street. We celebrated each other’s milestones and accomplishments like a big family. I also vividly remembered moments when my peer students lent an open ear and shoulder in my times of need. Professor Elizabeth Manias was the principal supervisor of my doctoral study. She encouraged and motivated me to take on a challenging video ethnographic research project. I encountered numerous obstacles during the data collection period. It was Professor Manias who had strong faith in me and shared every step of my progress. I am also grateful and indebted to my co-supervisor Associate Professor Marie Gerdtz who cultivated my interest in research during my six years at the University of Melbourne. What motivates you now? What do you love about what you do? I work as an Assistant Professor at Adelphi University in the US right now. I teach both undergraduate and graduate courses and the students are definitely my biggest motivation. I truly enjoy the opportunity to serve and shape the future nurses and nurse leaders. What drew you to your area of expertise? Before I went to Australia to advance my degree, I worked as an Emergency Department nurse in China for a couple of years. I also worked as a part-time emergency nurse while studying at the University of Melbourne. I relocated to the United States in 2014 because of family reasons. My experiences of studying, working and living in different countries always make me feel like a “global” nurse. I wanted to share my experiences with future nurses and inspire them to find their own paths. What do you consider to be some of the greatest accomplishments of your life and career so far? Being able to work in three different countries and experience such cultural diversity probably is one of the highlights of my life and career. Studying at the University of Melbourne definitely opened up my career opportunities. Seeing my two little children grow and pursue their own dreams would be the most exciting thing in my future life. To me, good health is to maintain a work-life balance. Choose a job that I love and enjoy the life I live. The best piece of advice I’ve been given is to learn to be undefeatable. Completing a PhD degree in a renowned research institute can be challenging. Take critical comments and get back up wherever you fall.